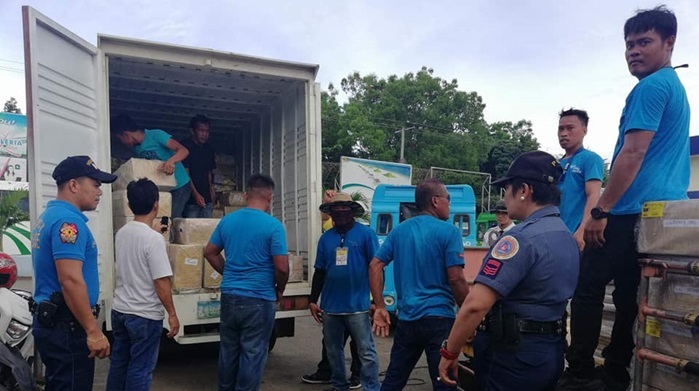 Election paraphernalia and supplies on Thursday were delivered to the Tagbilaran City Airport through a commercial aircraft ahead of the May 14 barangay and Sangguniang Kabataan (SK) polls, said a Commission on Elections (Comelec) official. Malou Cempron, election assistant II of the Comelec’s provincial office, told dyRD Balita that the materials which were flown to the province included ballots and other accountable forms. From the Tagbilaran City Airport, the materials were immediately transported to the Provincial Treasurer’s Office inside the Capitol in Tagbilaran City where these were stored for safekeeping. The items will then be distributed to various municipal treasurer’s offices in Bohol and Tagbilaran City on May 13 and will be delivered to the polling centers on Election Day, Cempron said. Personnel of the Bohol Provincial Police Office (BPPO) have been deployed to secure the election paraphernalia until these will be distributed to the poll precincts. In a joint command conference held Wednesday, the Comelec said that transportation arrangements for the materials are still being finalized. Officials are considering the use of government vehicles including police cars to transport the items to the voting centers. The vehicles however should be marked with “Comelec” stickers as indication of impartiality, the Comelec said.